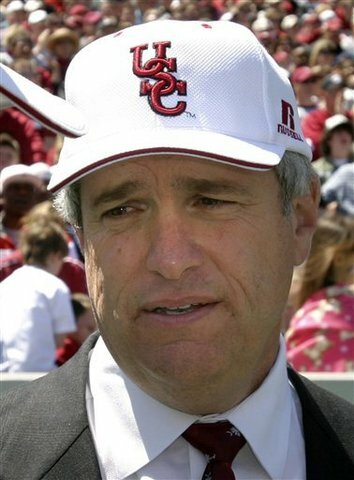 Even the most casual readers of this space are familiar with TRC’s ambivalence toward current former still current SC Athletic Director Eric Hyman. Despite gains in multiple areas of our athletics program, there was always something about the man that caused us to withhold our praise and cast a certain amount of scorn. Perhaps it was an overriding feeling that Hyman was not really one of us, that he put the wants and needs of the Gamecock faithful behind the demands of his own professional advancement. This apparent secondary emphasis came through in many of his early statements about Carolina (the fact that you just asked which ‘Carolina’ I meant proves my point, and betrays that the Gamecocks were only a tertiary concern, at best). As his tenure drew on, we were similarly disappointed to watch him fumble important issues, such as immediate and long-term conference football scheduling (as viewed in comparison to our crafty friends to the west, the Georgia Bulldogs) and the assignment of permanent football cross division opponents (USC/TAMU is a horrible idea, but let’s save that for another day). Hyman always seemed out of his league in conference-level decision making, and that only served to underscore our perception that we were only temporarily important to him. To put it another way: does it really matter how long it will be before UNC-Chapel Hill give us that return home football game we’ve been owed? Nope, ‘cause Hyman wouldn’t be around to see it anyway, right? Which brings us up to yesterday’s radio interview with SC Radio Network’s Phil Kornblut. In the interview, Hyman weighed in on our prospective AD search, and even hinted strongly that fan favorite Ray Tanner would not be qualified for the job. Many tweeters and message board denizens collectively spilled piles of Cheetos on parent’s basement floors over his audacity at commenting on the search, much less opining over a top candidate’s strengths and weaknesses. My own reaction was initially, and strongly, negative. I carefully put down my own bag of Cheetos and launched into Mr. Hyman via our TRC twitter feed. I even complained to my wife about it as we were brushing our teeth before turning in for the night (Mrs. Tbone was nonplussed by my outrage, by the way, and only yawned in response). Hyman accidentally let the cat out of the bag: AD Ray Tanner is already a done deal. Why else would a grown man discuss another grown man’s abilities and challenges in such an open way? Why would he comment on the differences between the AD job and a head coaching job? It’s no secret that the two men have disagreed during their common tenure, but would he take a parting shot at arguably the greatest head coach in Gamecock history? I suggest to you that even Hyman is not is that small. What he told Kornblut sounded like something he had said a time or two before. Perhaps to the Trustees, perhaps to Tanner himself. The AD job is different, you will need strong people around you, the learning curve will be steep, etc. all sounds like job advice, and not candidate selection tips. And perhaps most telling of all, Hyman indicated that a “national search” was always his philosophy as it served to “validate” an internal hire. In other words, you conduct the national search to reassure everyone that the best person got the job, when you knew all along that the best person was already in an office down the hall. Hate Hyman all you want (we’ll stand with you all the way) but I think he just bumbled his way to some big news. More idiotic blah blah blah…It doesn’t matter what Hyman does or did, he will/would never be able to win you haters over. You obviously have not been following gamecock sports for very long. This AD decision is more important than our next head football coaching hire. Hyman has helped Carolina get to it’s highest perch ever. More than likely we will not get another AD as good as Hyman and Carolina could very well fall back into SEC and national mediocrity. Let’s hope not! I hope that is not what it takes for you blind fools to finally see how valuable Eric Hyman has been. Is that you, Mrs. Hyman? Great AD my a$$. He didn’t hire Spurrier or Tanner. He did hire Horn. He was nothing but a fund raiser! Enough said! HATER!!! QUIT HATING!!! I DON’T LIKE IT WHEN YOUR OPINION IS DIFFERENT THAN MINE!!! HATER!!! God I hate that term.